Assault tank based on the Conqueror chassis with a 183mm gun mounted on it. The project was cancelled in the 1950s and it never saw military service. Known as the "(The Second) Death Star", this tank destroyer is well-known for its apocalyptic gun. Especially when loaded with premium shells, this monster is a death sentence to any tank and you must avoid frontal combat with this tank at all costs unless it's reloading. 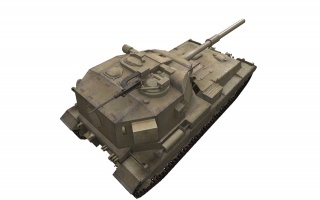 As a downside, the FV215b (183) can only turn its turret 45 degrees either direction. The gun has a horrific load time and low ammo capacity, comparable to SPGs, and is not very accurate. So as long as you can outmaneuver its gun range you will be able to destroy it. The FV215b (183) was replaced by the FV217 Badger turretless tank destroyer and became a special vehicle for those who had it before the replacement. - Very wide fire arc vs other British TDs or even TDs in general, although its turret is not fully traversable. - Horrible gun depression, weak side and rear armor, rear-mounted non-fully traversable turret, and horrible reload time makes it very vulnerable to flanking and hit-and-run. - Very weak roof armor, any hit from SPGs will guarantee either the driver dies, or the engine being damaged. This vehicle is very different from its predecessor. The 183mm gun is still immensely powerful(as powerful as the 180mm gun on the Object 261) and has a turret as well. Due to these facts, the vehicle is capable to spread fear and unorganized retreat under its opponents on close and middle distances, making it a quite powerful defensive unit. Nevertheless, these advantages are only useful in urban battlefields, where flanking operations are often unavailable for the enemy due to cover from the own team. On open and plain maps players should strictly avoid to lead a push in the first few minutes of a round if they do not want to get blown up by artillery fire and flanking medium or light tanks. Furthermore a player should look for good cover, where one can fire from . In case of the necessity of a push always stay in the second row and try to get flank cover from other tanks. If your teammates do not react or even refuse to cover you, try to use the landscape even more in order to avoid as much direct enemy fire as possible. When this is not possible, have an eye on the positions of the enemy and those of your team members and go to positions, from which you have natural cover from your team members (because then they will spot the enemy before they are able to spot you). Finally, if you have AP loaded, and you have a nice IS-7 in your sights, let the gun crack and see him lose most, if not all of his HP. Also, using gold HESH rounds, the FV215b (183) can easily turn an astray battle entirely in your favor. However, with only 230mm of penetration and a tendency for tracks and other spaced armor prevent penetration, the HESH shell is the ultimate in randomness and can only be used with careful aim or deliberate acceptance of 500 damage per shot. When using HESH avoid the sides of Russian heavies as they have thick spaced armor and always aim for weakspots when faced with the fronts of heavies, TDs, and even some meds and lights (E50/E50M and T54LW respectively) as if you were firing AP to maximize damage dealt and possibly get a penetrating hit and do full damage. Vehicle is elite in its stock configuration. The story of Britain's most powerful tank destroyer began in late January of 1951, when it was decided to develop a tank destroyer even more powerful than the FV4004 Conway, armed with a 120 mm L1A1 gun. It was destined to become the most powerful tank destroyer ever built. According to the requirements, it had to confidently penetrate a target with 150 mm of armour at 60 degrees from almost two kilometers away. This target was based on the IS-3. After appearing at the Victory Parade in 1945, this tank was considered the most dangerous opponent of Western tanks for decades. In order to meet these requirements, the designers had to find a much more powerful gun than the L1A1. The British didn't bother with the small stuff and went right up to a caliber of 7.2 inches (183 mm). Using such a powerful caliber was no accident. This new gun was based on the 183 mm BL 7.2 inch Howitzer, which was developed from 8-inch howitzers dating back to World War 1. Initially, the howitzer had a barrel length of 22.4 calibers, but later versions of the howitzer extended the barrel length to 33.1 calibers. Unfortunately, even this extension was not enough to fight Soviet tanks. 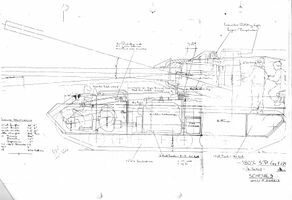 In 1950, work started on the QF L4 gun, the most powerful tank gun in the world. The gun weighed a little under 4 tons and had nearly 87 tons of recoil force. 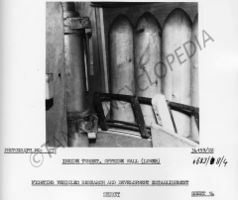 In order to clear the fighting compartment of propellant fumes, the gun had a fume extractor fitted. Only one type of shell was planned for this gun: HESH (High Explosive Squashed Head). Not only is the caliber of the L4 stunning, but also the weight of the rounds. The propellant was separate from the shell, but this didn't make the loader's job much easier: the mass of the shell was 72 kg, and the mass of the propellant was 32.8 kg. 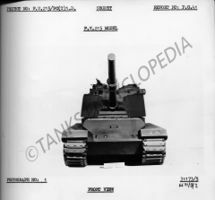 The 183mm was tested in live fire trials against a Centurion and a Conqueror. In 2 shots, the 183 blew the turret clean off the Centurion, and split the mantlet of the Conqueror in half. A fully armoured fighting machine (effectively a tank) with a fully rotating turret. An SPG with powerful front armour, but a limited traverse angle. An SPG with a fully rotating turret, but thin armour. An SPG without armour. The contract to develop the first variant went to Morris and was later transferred to Vickers-Armstrong. The chassis of the heavy FV200 tank was used, with the suspension from the heavy FV214 Conqueror tank. 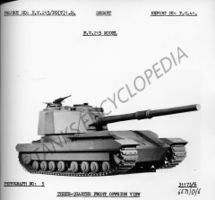 The project had multiple names: Heavy Gun Tank No.2, Heavy Anti-Tank SP No.2, FV215 Heavy Anti-Tank SP No.2 or simply FV215. The index Heavy Gun Tank No.2 was incorrectly interpreted by historians, resulting in a mythical project called FV215B. In reality, all these indices pointed to the same vehicle armed with the 183 mm L4 gun. This project combined the first and second variants. 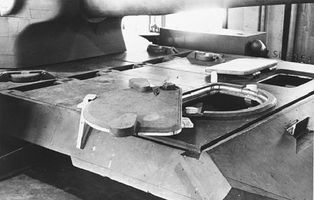 Theoretically, the turret could rotate fully, but the gun was limited to firing within a 90 degree arc. The turret was placed in the rear in order to prevent the huge barrel from sticking out too far. The ammunition capacity was only 20 shells. The rate of fire of the tank was supposed to reach 6 RPM. but whoever set that requirement was a hopeless optimist. The size of the turret did not allow for a loading mechanism, and loading that quickly by hand was not possible. Aside from the gun, the tank had two machineguns. One was a coaxial Browning .30 Cal. (7.62mm) machine gun, supplied by 4000 rounds. It was mounted in a small structure on the forward right of the turret roof. 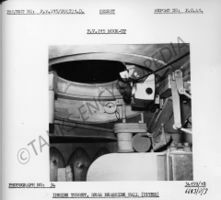 The other machine gun was an .50 cal (12.7 mm) M2HB on an AA mounting above the Loader’s hatch, on the right rear of the turret. The 65 ton vehicle was supposed to accelerate to 31.7 kph. In order to achieve this, the tank would have an 810 hp Meteor Mk.12 engine. As for the armour, it kept changing throughout the development process. The thickness of the upper front plate varied between 125 and 152 mm, the sides were 50 mm thick (plus spaced armour). As for the turret, the specification was only for the front, which was 254 mm (10 inches) thick. The FV215 Heavy Anti-Tank SP No.2 was not meant to be. Morris was supposed to first build a full scale model and then two prototypes: one for mobility trials and one as a target for armour testing. In June of 1954, Vickers-Armstrong, the new owner of the contract, was given the same task. Development of the SPG continued until January of 1957. At that point, the full scale model and 80% of the blueprints were ready. But, the War Office got its own Khrushchev and the development of the FV215 Heavy Anti-Tank SP No.2 was shut down in favour of ATGMs. Wooden mock-up of the FV215. 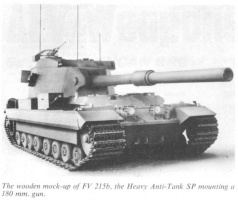 Despite the caption, the "b" in FV215b was due to confusion over the FV215 project's many names. 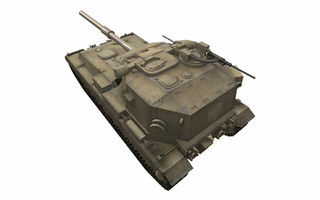 The "(183)" is only used as in game name to distinguish it from the other FV215b heavy tank which is completel fictional. However, the actual designation wasn't FV215b, but just FV215. The 183mm gun was never supposed to have ability to shoot AP or HE shells; only HESH. Due to "balancing" reasons; the premium HESH round type was changed into HE in order to makes it can dealt damage to enemy tanks even it hits spaced armor. This page was last modified on 20 December 2018, at 21:27. This page has been accessed 442,761 times.